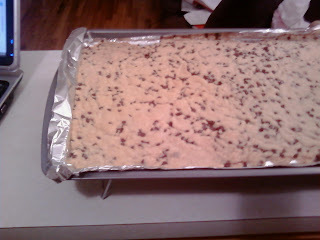 If you've been reading my blog for more than a few days, you'll notice a disproportional amount of bar cookies. I love bar cookies. They're easy, they bake in one batch, and they still have that adorable individual feel. When you bake in a tiny little oven like I do, sitting there while three different batches of cookies come in and out can get tiring. 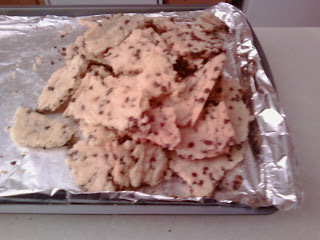 So, when I spotted this recipe for cookie brittle, I knew I had to try it. You get a chocolate chip cookie without the scooping, waiting and multiple batches. Plus, you get to break stuff. What could be wrong? 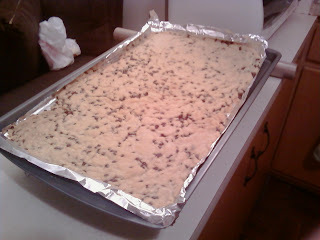 The recipe is simple, just the usual chocolate chip cookie ingredients, with slightly different proportions. I used mini chocolate chips in this, partly because I'm obsessed with them, and partly because I think they work better in a recipe like this. You then press the dough into a pan (I use my small cookie sheet - don't ask me the exact size) and bake it for 20 to 25 minutes. Anyway, I liked this recipe, it was simple and easy and the cookie was nice. Not great, and I think that's really because I fudged a little with the ingredients. Though the recipe calls for 2 sticks of butter, I had 1 stick, and 6 tablespoons in my fridge. So I used that, and a drop of vegetable oil to make up for it. I'd definitely like to try it again with the right amounts. Tip of the Day: Using room temperature eggs in your recipe will help them better incorporate into the rest of the ingredients. Mix together the butter, vanilla and salt. Stir in the flour and sugar until well mixed. Spread dough in to a greased 15x10 jelly roll pan. Bake on 375F for 20 to 25 minutes. Let cool completely, then break in to pieces. Thanks for the recipe! Great site!